Earlier this year, Garrett (aka @roheblius) tried to re-start our #SFGiantsHeatCheck blog by asking each of us a prediction-type question related to the 2014 squad. Because my fellow bloggers ran into life challenges, I was the only one to respond. I'm posting my thoughts here because: a. the Heat Check blog will likely never materialize; and b. I was freaking right. Which one player is going to define the season for the Giants? There were only two significant changes to the team that backed up their second World Series ring in three years by throwing up an absolute dud of a 2013 season that peaked in late May on an inside the park home run: Tim Hudson was added to provide depth in a weakened starting rotation with several lingering question marks; and Morse was brought in to hit more than five home runs while playing a mediocre-to-watchable left field. So far, so good. Hudson looks like the staff ace, and Morse has shown a power stroke and penchant for the so-called "clutch" hit while not yet embarrassing himself with the glove. 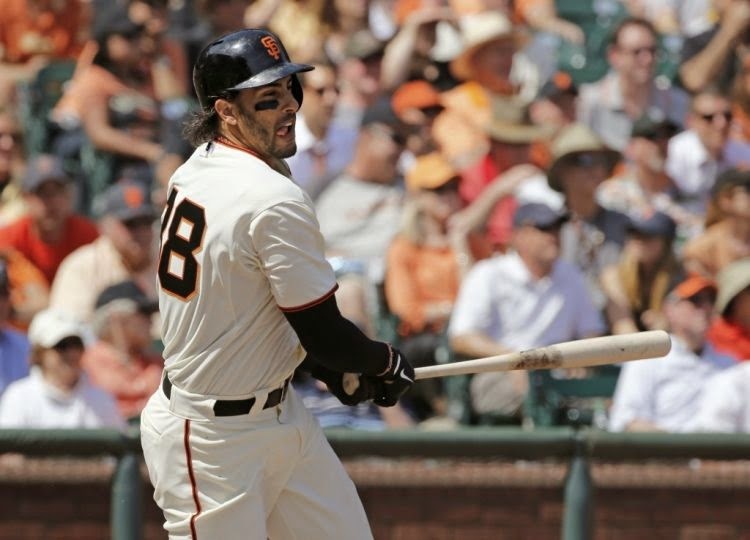 Meanwhile, the rest of the carryover roster has been inconsistent at best — Brandon Belt's early home run barrage and Angel Pagan's scalding hot start notwithstanding. 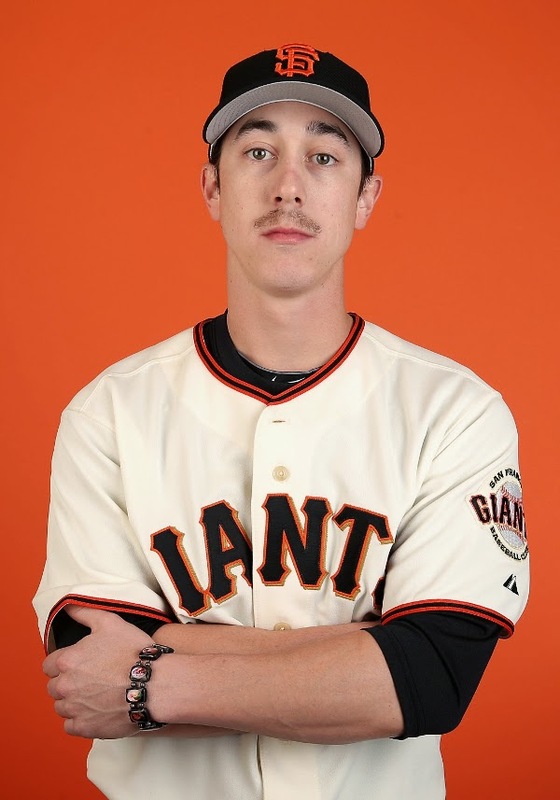 But while I think Hudson's steady, steely-eyed consistency will help to stabilize the pitching staff over the long haul, it's the fire in Morse's deeply stoned-looking eyes that leads me to believe he can be this year's Brian Wilson/Juan Uribe/Hunter Pence slightly deranged clubhouse glue guy. Morse just doesn't fit the straight-laced, southern aristocrat mold of a Gerald Dempsey "Buster" Posey, the current face of the franchise. He's a goon, a goofball, a guy who takes his practice chops in the on deck circle like a lumberjack winding up to take down an oak, who can get the crowd to sign along with A-ha! as he struts to the plate, who does dances of jubilation after two-out, two-run ground balls up the middle. In short, he's exactly what this team needs to find their mojo. Besides, Pence's sunflower seed showers are so 2012. As you may have noticed, it's been a while since I've written in this space, and frankly, I'm a little rusty when it comes to my sportswriting chops. I've been locked into the political and nonprofit world for so long that I fear any mention of Pablo Sandoval's contract negotiations will come with an entirely unintentional diatribe about the history of organized labor and the power of solidarity. So bear with me, folks. It's gonna be a long, bumpy ride back to coherence. So far as the team on the field is concerned, there's some added depth, and the lineup certainly has the potential to produce at a higher clip than we're accustomed to. But it all comes down to the health of the starting rotation and the dexterity of the bullpen. Unlike a lot of fans, I'm on board with pitching and defense as the backbone of a team that plays 81 times a year in a park built to reward pitching and defense. We were spoiled by the Bonds years into thinking 40-HR seasons could be the norm at McCovey Cove, but anyone with eyes and a brain can tell you that's fool's gold. No, this team will rise and fall on the backs of the Bum, the Horse, the Freak, Huddy, and the Vongelsong. (Sounds like some hippie band from "Inside Llewyn Davis" when you say it like that.) If Matt Cain posts another 4-plus ERA; if Timmy can't translate his sabermetric superiority into W's for the team; if Vogey can't resurrect the attitude that put him on the All-Star team two years ago; if Hudson's ankle falls apart... There are just too many ifs to ponder. So let's not and hope for the best. After all, not like any of this is up to us. Right? The Opening Night contest was a fun little excursion into Wackadooville. I tried to break down the game a million different ways, but this is the best I could do: Somebody won, somebody lost, errors were made. Madison Bumgarner was meh, but didn't exactly get shelled. Brandon Belt had a rollercoaster ride on the Twitter but eventually redeemed himself — and rewarded my faith in drafting him for my fantasy team (errors don't hurt my stats). And Buster Posey did... what Buster Posey does. Amazing what an added 10 pounds can do. Maybe I should hit Five Guys today and start a new regimen. Talk to you soon. I hope.